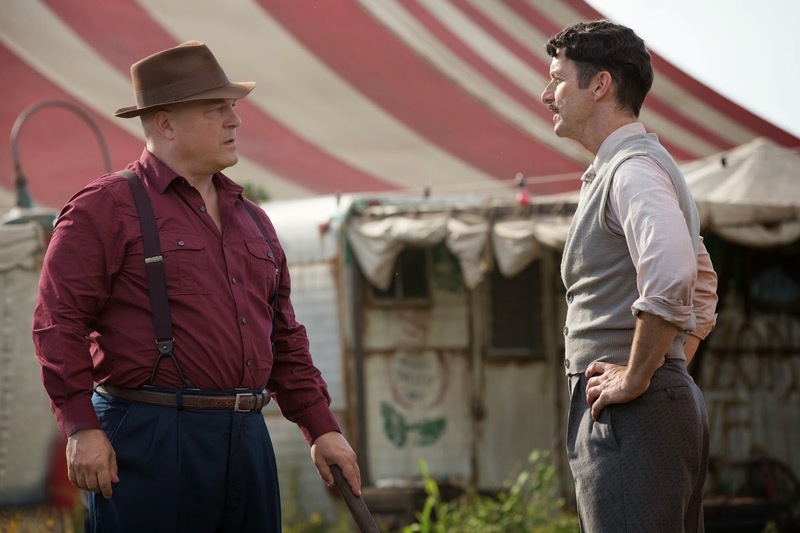 GeekRex | Review: American Horror Story: "Test of Strength"
Review: American Horror Story: "Test of Strength"
FX aired the seventh episode of American Horror Story: Freak Show, “Test of Strength,” Wednesday night, but I think it was more of a test of patience. This episode is incredibly slow paced. The plot hinted at things that may occur in future episodes but, even after finishing it, it didn’t feel like anything substantial happened. The episode contains several scenes that I think were completely unnecessary and not essential to the plot. For example, the first scene after the credits was a bizarre performance of a Nirvana hit by Jimmy, the “Lobster Boy.” His character is involved in most of the seemingly pointless storylines of this episode. He rescues the twins and accuses Elsa of being a liar just to have Bette and Dot lie to the troupe, falsely saying that Elsa saved them instead of selling them to Dandy. He has a drunken father-son moment with the Strong Man when he reveals he knew all along that the Strong Man was his father. Jimmy heard from alumni troupe members that the Strong Man’s family history is full of lobster hands. Jimmy also nearly exposed Dandy for being part of Twisty’s crimes. But, alas, he didn’t. Many shocking events almost occur, or may have occurred in “Test of Strength.” Jimmy almost catches Elsa in her lie about selling the twins, he almost accuses Dandy of trying to saw Maggie in half, and the Strong Man almost attacked Amazon Eve and may have killed a beloved member of the Elsa’s troupe. However, given this season’s frequent use of dream sequences, it’s difficult to say if anything truly occurred. The characters hardly changed or developed at all in this episode. Nothing can sway Elsa from being blindly loyal to Richard and believing he will bring her to stardom at last, not even the twins saying they don’t trust him or Richard himself suggesting to Elsa that they kill a member of the troupe. Ethel continues to drink herself to death. Maggie is still half-in and half-out of Richard’s twisted plans, helping him blackmail the Strong Man but still begging Jimmy to run away with her. The Strong Man is predictably hostile, violent, and remains the bane of every woman’s existence. Jimmy is in a constant downward spiral trying to maintain his morality despite being surrounded by immoral people, and Paul is still dying in a trailer. 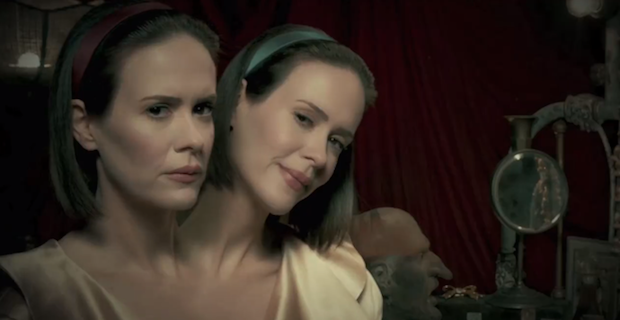 The only characters who seem to be evolving are Bette and Dot, although something about their storyline is lacking. They have become more and more self-serving, cunning, and manipulative as the season goes on. Bette tells Elsa she wants to have surgery to separate her sister and herself. Dot obviously hears this but doesn’t seem to react at all, even though she knows the doctor Bette wants to perform the surgery failed at his last attempt, leaving one conjoined twin dead. It’s difficult to fathom that Dot would have no reaction whatsoever to the news that she or her sister might die at the hands of a surgeon sometime soon. Three main events from this episode stand out: Richard blackmails the Strong Man by threatening to tell everyone that he’s gay, Bette and Dot blackmail Elsa by threatening to tell everyone she sold them to Dandy, and Paul’s girlfriend gets a surprise visit from a so-called artist when she returns to her father’s house to gather her belongings. Without giving away the only few interesting events from this episode, I’ll stop myself there. Although I've enjoyed the season overall, "Test of Strength" is certainly one of the low points.